Samsung and LG have both definitely made great advances in terms of display development – the LG G Flex pioneered the bendable smartphone display tech, while the Samsung Galaxy Note Edge was the first smartphone to have a curved glass. The companies are not done, however, as representatives of both have spoken with Business Korea and revealed possible branches of the display tech that each has been working on. LG spoke about transparent display tech – something that currently exists for niche applications, such as heads-up displays for aircrafts and luxury vehicles. According to the company, it still has a way to go before commercializing and mass-producing the tech. The unnamed Samsung official, on the other hand, spoke of foldable smartphones and that it will be possible for the company to produce them in 2016. Now, we know that Sammy has been playing with flexible prototypes for a while now – it has been granted a patent for a foldable smartphone display, foldabe tablet, and has demoed an early variant of the tech at a presentation event, back in 2013. However, this is also not the first time that the company promises a foldable display for "next year", so we'd wince at this promise. Still, we'd be happy to see at least a prototype so we could – you know – gawk at. Samsung and LG are one of the most innovative companies in the world today. +1 bro for your meaningful comment. No one come close to them, let alone Apple. Long life Samsung & LG! apple fans are actually worse. Dude, it seems ironic that you are the one obsessing with these guys. They were only expressing their opinion and you're also free to express yours too. But it is a little off to say you will go after them to ban them and quote "mark my words!!!" unquote. Seems a little obsessive and a bit homophobic. Do you have a problem with gay people? He's just trying to get some attention ... nevermind him! The only person here who needs to be banned is you. You follow him around like a little puppy dog with your offensive comments. This is a tech website & you don't even discuss tech. You just talk about SuperNova. Grow up. If you're not interested in discussing tech, then go away. Either way, I have reported YOU. Your homophobia is disgusting. Everyone green thumbing this guy should be ashamed. What strain do you take? Believe me, it doesn't suit your Blood. What makes you think PA won't ban you instead of this guy. I guess your problem is that he is a Samsung fanboy. Anything wrong with that? I believe everyone has the right to opinions here. I agree. 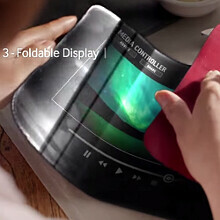 Samsung looking forward to make bendable/foldable mobiles and LG is making Transparent screens. I think japan is most one of tech same korea but they are just slow economic and marketing. Sounds great to me. Maybe this would be implemented in the Note 5 with double screen size and the ability to flip over each other thousands time without breaking. Not joking here, but Samsung and LG are the only true innovative companies here and I'm really passionate about that. They just keep going beyond boundaries and creating the world without weakness. Reported again. Grow the eff the up. A tech website is not the proper place for your homophobic comments. I can't wait to see you banned. Bullying is not cute or funny. Anyone who green thumbs this guy should be ashamed. I don't have anything to be ashamed of. I don't care if he is a paid shill or not. What I do care about is how inappropriate your comments toward him have been. If you don't like it, there are many other places you can go visit. I will never stand for that kind of behavior. No problem. Make TV's with flexible screens, 32" TV can convert onto a 40" widescreen for movies. "...while the Samsung Galaxy Note Edge was the first smartphone to have a curved glass." Really? The first? You must be kidding me. Do PA writers not know anything? Japan was the most one of technology too but they are slow for Marketing strategy.